Five hundred and ninety-seven pages and I'm wiped out! Wiped out on Montgomery, that is. (Is that even possible?!) The Gift of Wings is an in-depth look at the woman who wrote my beloved Anne of Green Gables stories (as well as many others, all of which do occupy space on my bookshelves!). 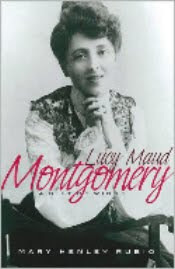 Mary Henley Rubio, in preparation for writing this book, interviewed countless people who knew Montgomery personally. Furthermore, she interviewed them all before Maud's journals were published so as to receive untainted information. There are five published "selected" journals of Montgomery's and I have only read Vol. 1: 1889-1910 to date. I would like to read the other four, however, I've discovered over the course of this past year that I can only take learning about one of my favorite authors in small doses. For all the cheer that she presents in her written stories, her personal and private life reflected none of it. She was a miserable and pitiable woman, constantly constrained by the worry of what others would think of her. She married for convenience and not love, and eventually grew to despise her husband. She was an overindulgent mother who had no control whatsoever over her first born son, Chester. (He eventually landed in prison.) She found countless legal battles with her first publisher, L.C. Page, who was a complete goon in his own right. Really there was little to feel happy about in her life. The thing that struck me most in reading this biography of L.M. Montgomery's was how she placed so much value on human success, achieved it all, and found herself in the depths of despair anyway. Growing up I always speculated that she had to have been a Christian because she married a minister but that was not the case. She eventually came to the position that religion was outdated and the church was losing its validity in society. Science, in her opinion, was more reliable and should rule the day - not "religion" (as she termed it). So then I wondered that if she were not a Christian, how must her minister husband have felt about that? Well, my first guess is that he had no clue to his wife's spiritual health and well-being. He did his thing and she did hers. They barely crossed wires, except, when it would seem, it was absolutely necessary. There was affection between them to begin with, but that faded in time with his declarations that God hated him and that he was damned to hell. To put it bluntly - she despised him for his weaknesses. Prone to depression himself, Maud's husband could barely function for himself, let alone be in a position to lead a family - let alone a church! It's really sad. The Montgomery/Macdonald family was full of potential but low on hope. They bickered a lot and Chester kept his parents on edge with his gallivanting across the countryside, bedding women, lying, stealing and failing all of his coursework. (He was a miserable son that Montgomery eventually came to loathe inspite of herself and thought was a horrible blight upon humanity. And so he was!) It just seems that everywhere Maud turned, she was met with hopelessness and despair and so filled herself up with the same. It goes back to Proverbs when it talks about surrounding yourselves with faithful people (who will encourage you and build you up - see Proverbs 4:14-27 , 13:20 and 14:7). It was clearly evident that Maud was clueless as to how to handle various situations that arose with people in her life because she was not surrounded with faithful people who could offer good counsel and support. So where did her books come from? She was obviously a gifted story-teller and the public rallied to her books with a great deal of enthusiasm. She knew what they wanted to read and she knew how to provide it. Writing was an escape from reality for her. It was what she did when she needed to get away. She lived "dream lives" inside of her mind, went on long walks to develop ideas for stories, and shut everyone in her life out whenever she took up her pen. Her family paid the price for her fame in a big way. We only have these stories to enjoy because she was miserable and did not know a way out of that misery except to write. It's enough to almost make me feel guilty for enjoying her books so much! They came at a great cost - and I am not talking about lost royalties! I'm talking about family, faith and freedom to live. As I mentioned earlier this year, this book reveals the fact that Montgomery quite possibly committed suicide to end her earthly sufferings. It is hard to say that accurately, because she was also taking a few medications that could have poisoned her system to such a degree that an accidental overdose was possible. One thing is for sure - she stated to many people that she was so miserable that she found death to be a welcome concept. She no longer wanted to live. All hope within her had died long before she did. There is something to learning awful things about people you admire. It grieves me to think that someone I've always envisioned as being so full of life and happiness was really dark and miserable. People on pedestals are apt to fall, I suppose, but we certainly don't make it easier on ourselves (or them!) by putting them there in the first place. We do have lovely stories from Montgomery's pen and imagination and I will continue to enjoy them whole heartedly. Montgomery did appreciate beauty and she knew how to communicate that both verbally and in writing. She had the gift of humor which she shared with others and that is valuable. Certainly I would not say that her works should be written off because of her private life. On the contrary! I would say that the beauty of the books are more appreciated because I recognize that the cost was great to produce them. To me, there is always an "edge" in Montgomery's works, especially toward religion/Christianity. It's VERY subtle, but it is there, at least to me. I suppose this would explain it, huh? She is still, as you say, a very gifted storyteller. That's so sad -- especially her turning her back on Christianity and not realizing it wasn't conventional religion that saved, but Christ. I was thinking as I read that writing must've been an escape for her, then I saw that later in your post. Like you, I would still enjoy them anyway, but this makes me feel that I am enjoying something that gave her some measure of cheer and comfort, at least for a while. P.S. -- The word verification letters usually don't spell real words, but the one showing this time is "huggiest" thought that was cute. :-) Sounds like a description of a favorite teddy bear. I think that under a lot of the jargon that Christian's spout, most people sitting in pews question their beliefs. Remember, these are thoughts Montgomery divulged to the privacy of her journal -- not her fellow church-goers. In fact, I think it's refreshing to think of someone so close to pulpit asking honest questions and being self-aware. Wow. I don't think I want to read it...Your summary was great...but sad enough that I don't need all 500+ pages.